Directs and manages field related operations including assigned crews, both internal and external (sub-contractors). Ensures all equipment, programming, and documentation needed for the project is obtained before arriving at the job site. Works with Project Manager to maintain an accurate schedule, track progress and provide daily updates for project status. Works with the engineering staff for any design or programming needs. Capable of effectively interacting with other construction trades, sub-contractors, and end users. Responsible for system commissioning and all field related documentation. Excellent working knowledge of AV Installation practices & procedures. Cable Pulling, Rack Building, Signal Termination, System Calibration, System Testing. Knowledge of Videoconferencing Systems required (Polycom, Cisco, Skype for Business). Ability to read and use CAD/Blueprints and other design drawings. Infocomm Certifications preferred (examples: CTS, CTS-I, CTS-D). Extended travel as much as 50%. Operations Team to compile CAD and other AV line drawings into an integrated file format for review. The Senior Audio Video Design Engineer role is responsible for the design and specification of custom audio video and teleconferencing distribution systems. The engineer designs meeting space systems and pathways for the associated infrastructure. Designing and building teleconferencing and low-voltage audio video systems including: appropriate system concepts, calculations, layout, sizing, selections, specifications, and coordination with sales and operations. The successful candidate should have experience in audio and video conferencing, digital signal processing, mix/minus audio, room control systems, multi-source signal distribution of electronics over low voltage wiring. * Act as liaison between and meet with sales, project management, and operations when a project is turned over for installation. * Assist project teams with producing project deliverables. Want to know what it's like to work at Smarter Systems? After reading this article on Glassdoor, we decided to give you a little insider information about our company culture. We want to be transparent with future team members to make sure we're not only a good fit for them, but they are a good fit for us. Below you'll find a few answers to some of the questions we think are essential in the hiring process. What was the last big achievement that was celebrated? In 2018, Smarter Systems saw exponential growth, nearly doubling the size of our staff. We also celebrated the largest single purchase order in our company's history. We were awarded the highest sales growth for the Carolinas region from our partners at Biamp. What’s the dress code like here? Our policy is "use good judgment" but always be presentable and professional. There is a casual dress code for the office. Team members wear jeans and less formal business casual clothing. The Installation team wears Smarter Systems polos with jeans or khakis when they are in the field. What activities do you offer for employees? We hold potlucks each month to celebrate team birthdays. 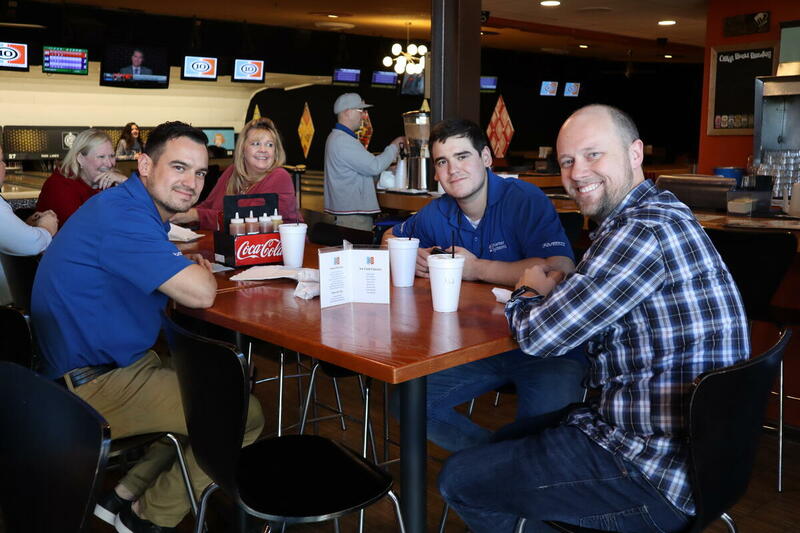 Throughout the year we do team building activities like bowling, picnics in the park, and offsite parties at local restaurants. What was the biggest challenge last year and what did you learn from it? The growth we’re experiencing is so exciting and has pushed us to expand in every area of the business. Our processes are evolving with our growth. As roles move from general to specialized, inter-team as well as external client and vendor communications must be clear and focused on keeping everyone informed. What do people on the team that I'd be joining do for lunch every day? Any given day you'll find people eating in the break room, some running to grab a bite and even some who choose to sit at their desk. There is no expectation for lunch and depends on what you are comfortable doing with your lunch break. In 2018, we chose to give back as a group. We volunteered our time sorting food at Second Harvest Food Bank.